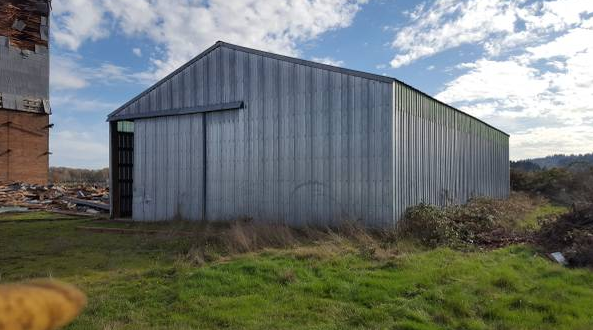 40’ x 60’ Used Pole Building – $14000 (Silverton) SERIOUSLY? #10 It is all galvanized steel – generally most folks do not find this to be aesthetically pleasing! And the #1 reason – For about $3,000 more, you could get a brand new post frame building designed to meet the building code, with all new materials, delivered to your site, with all colored steel roofing and siding PLUS engineered plans! 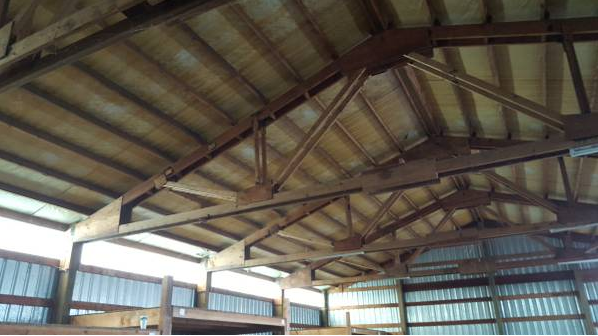 This entry was posted in Pole Barn Design, Pole Building Comparisons, Building Department, Constructing a Pole Building, Pole Barn Planning, Pole Barn Structure, Professional Engineer and tagged Building Code, galvanized steel, lateral truss bracing, Oregon agricultural exemption, truss plywood gussets, flat wind girts on December 20, 2016 by admin. In yesterday’s blog, Mike the Pole Barn Guru started to share some secrets which should both increase your bottom line as well as allow you to sleep soundly at night. A short recap here, for the full account, read Part One posted yesterday, May 25th. Moving on to “the rest of the story” on prefabricated roof trusses. Truss design programs calculate the roof snow load using Pg as the basis and multiplying it by several factors. This is the formula for the relationship between the ground snow load and the roof snow load adjusted for slope or Ps: Ps = 0.7 X Cs X Ce X Ct X I X Pg. All of these factors should be clearly outlined on any set of plans being submitted for a structural plan check to a building department. If not, or there is some doubt, the engineer of record for the building should be consulted to make a written determination. Cs is the sloped roof factor. Metal roofs are assumed to be slippery surfaces unless the presence of snow guards or other obstructions prevent snow from sliding. It is calculated based upon whether the roof is warm or cold, the nature of the roofing material, and the slope of the roof. With heated, steeply sloped and/or slippery roofs, these reductions can be significant. The Exposure Factor (Ce), is most often 1.0, but can vary from 0.7 to 1.2 and can make a huge difference in both truss design and price. The Thermal Factor (Ct) for heated buildings will be 1.0 or 1.1. However, most post frame buildings are not heated year round, and if so the factor should be 1.2. Most truss manufacturers assume a Risk Category II (shown as “Is” or “Importance” factors on truss design drawings). Many post frame buildings will not result in the loss of human life in the event of a failure, given they are used for agriculture or storage and are Risk Category I. This alone can reduce the roof snow load by 20 percent as compared to residential, office or manufacturing type structures! Will the building be in an area with little or no snowfall? Don’t forget area reductions. If the truss span times the truss spacing is over 200 square feet, a reduction is in order. This calculated value can reduce the roof live load (Lr) to as little as 12 psf. Further, if Lr is greater than Ps (sloped roof snow load), the Duration of Load for roof loads is now 1.25, instead of the 1.15 typical default value. What can you do? Make sure the values of Pg, Cs, Ce, Ct and I as shown on the plans, are provided to the truss manufacturer and are reflected on the drawings you will be asked to sign off on. One other important thing to look for – the “fine print” on the truss drawings should state the trusses are designed for an unbalanced snow load (think drifting). Some truss manufacturers will ignore this crucial component of design, in order to reduce their truss price. Now, let’s save you some money. 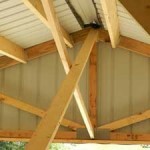 Truss bracing is important, and when neglected can result in catastrophic failures. When overdone, it can kill a building budget in materials and labor. The truss company will produce preliminary drawings and ask you to “sign off” on them, prior to production. Look at the interior members (webs) which require lateral bracing. These are most typically longer webs which are in compression. Often bracing to web members can be reduced or eliminated by asking the truss designer to switch the direction these long webs run, which will place them in tension. Increasing the size and/or grade of the web can also help. These changes are generally less expensive than the cost of the added bracing. Lateral bracing needs can also be reduced by using trusses which are physically doubled – installed face-to-face without blocking in between. If your standard building design is for single trusses every four feet placed on a truss carrier spanning eight feet between columns, consider going to a double truss every eight feet, which eliminates the need for truss carriers. Why would this reduce bracing? Because the double truss is now a three inch wide member, instead of 1-1/2 inches, for the most part cutting bracing needs in one-half. Using trusses spaced over ten feet apart? The truss drawings probably show lateral bracing as a single 2x spanning from truss to truss. Any truss braces spanning over ten feet should be done as “T” or “L” braces, otherwise they can fail in weak axis bending (the skinny direction) under a load. Learning to read and understand the information on truss drawings is crucial to the success of your business. Don’t make the assumption the truss company is going to be right. If there is something on a truss drawing which is unclear, ask the truss provider to explain it – in layperson’s terms. And, if you still have any doubts, ask your RDP. This entry was posted in Pole Barn Design, Building Department, Pole Barn Planning, Pole Barn Structure, Trusses and tagged truss design, truss bracing, Cheyenne Mountain Zoo, lateral truss bracing on May 26, 2016 by admin.